Four Palm Beach State College Panther baseball players were selected this week in the Major League Baseball draft. Pitcher Gio Arriera was picked in the fourth round by the Detroit Tigers, pitcher Jared Johnson was picked in the 17th round by the Washington Nationals, shortstop Matt Morales was chosen in the 23rd round by the Kansas City Royals and pitcher Kyle Farjad was selected in the 33rd round by the Miami Marlins. According to PBSC Head Coach Kyle Forbes, this is the most Palm Beach State players to be selected at one time since he began coaching in 2006. This number, however, could rise as Forbes says he is still getting calls from interested scouts on other players. Arriera started the NJCAA Region 8 State Tournament game against Chipola, giving up six runs in 2-2/3 innings. 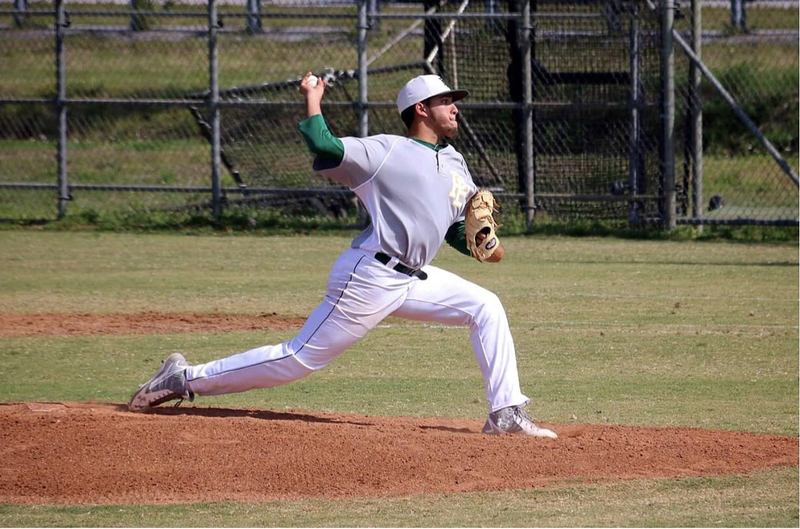 The 6-foot-2-inch, 220-pound sophomore went 10-2 with a 3.89 ERA in 16 appearances for PBSC, striking out 90 batters in 78 2/3 innings pitched. He averaged 10.89 strikeouts per nine innings. For Johnson, the news left him ecstatic. Gio Arriera throws a pitch during the NJCAA Region 8 State Tournament. Each player now goes on to play for their MLB team’s minor league affiliate with the chance of playing for their major league team down the road. Last year, two Panther baseball players, Mack Lemieux and Shane Sawczak, were drafted to a MLB minor league team. Lemieux played for the Hillsboro Hops, a farm team for the Arizona Diamondbacks, and Sawczak for the Matavia Muckdogs, a farm team for the Miami Marlins. This year, the Panther baseball team was named as the state runner up and finished the year 38-15. They were also ranked 18th in the national poll. it looks like Matt may get to play with the Storm Chasers in Papillion Nebraska. Nice Venue. They Seldom lose.